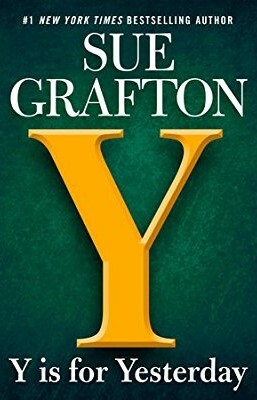 25 years ago, I never believed Y is for Yesterday by Sue Grafton would ever get published. When I first heard of Sue Grafton’s alphabet series back in the early 1990s, I thought it was a dumb idea. After all, the alphabet has 26 letters, and that meant there would be 26 books with the same detective, Kinsey Millhone. I was reading B is for Burglar, and I thought it was pretty arrogant for an author to assume she could get 26 books out of the same character when she was only on her second novel in the series. That just shows you what I know. It’s over 25 years later, and Sue Grafton is on her 25th book in the series. I don’t know if all the books are good because I’ve only read a couple of them. I remember that I enjoyed parts of the books, but I thought there were too many details about her characters’ personal lives and habits, and sometimes unnecessary details slowed down the story. Again, that shows you how much I know. Her die-hard fans love the details about her characters’ habits and personal lives. Those details separate her novels from the countless other detective novels out there, I guess. Sue Grafton’s fans will defend her when a blogger like me criticizes her for writing about too many mundane details about her characters’ habits and personal lives. I wish I had fans like that. I’m jealous. Even James Patterson fans don’t defend him like Sue Grafton’s fans will defend her. I respect an author who has fans like that. Anyway, about Y is for Yesterday. The beginning is different from the other Kinsey Millhone books I’ve read. Usually the action focuses on the detective as she solves the case (and does a bunch of other stuff that has nothing to do with the case). In contrast, Y is for Yesterday starts off 10 years earlier than the rest of the story at a private school and focuses on a girl who is not Kinsey. In the interest of conservation, Henry had stripped his backyard of grass, which left us with dirt, sand, and steppingstones. Henry’s two Andirondack chairs were arranged in conversational range of each other on the off chance we might want to enjoy a late afternoon cocktail as the sun went down. This was never the case. I didn’t want to sit contemplating barren packed earth, which doesn’t promote relaxation in my humble opinion. His potting bench and gardening gloves were superfluous and the row of larger tools he’d hung on the side of his garage- shovels, wood-handled garden forks, and pruning shears- had been unused for so long the spiders had spun webs and now lurked in ominous arachnid tunnels in hopes of snagging prey. Henry’s cat, Ed, seemed to look on the backyard as one big litter box and he made use of it every chance he could- one more reason to avoid the area. That’s not bad writing at all. But Grafton’s books have the reputation for using lots of seemingly unnecessary descriptions. To be fair, there isn’t much like that in the prologue or first chapter. So far, the novel moves at a decent clip, faster than some of her other books. Even though Y is for Yesterday was published in 2017, it takes place in 1979 and 1989. I wonder how difficult it is writing about those time periods without using anachronisms. I grew up in the 1970s, and I have false memories of me checking my cell phone all the time as a kid, even though I know I’ve only had a cell phone for about ten years. It might be easier to write about the 1800s than it is about the 1980s because there’s no way you’ll accidentally put a cell phone in an 1800s story, unless you’re writing steam punk. I know Sue Grafton isn’t going to have Kinsey Millhone carry around a cell phone in 1989, but it would be cool if she did. It would probably help her solve the case more quickly. And it would make the everyday descriptions of Kinsey Millhone’s personal life and habits more interesting. A & B are pretty bad, C gets good about halfway though, as if Grafton finally figured out what her style was…the rest have been from “very good” to “great”. The books are as much about Kinsey as they are about the cases she’s solving. And you really have to read them in order to get a lot of the stuff about her habits. I read and enjoyed her earlier books. But the last few ones (I think from R onwards? ), she’s just been phoning them in. X in particular was so horrible. « Should You Finish Reading Books You Don’t Like?